2015 has been a great year for me as a wildlife photographer. Lots of travel. Exciting experiences. New friends. In the process, I made some photographs that I am happy with. Most of my travel was to 3 places – Andaman & Nicobar, Ladakh and Agumbe. No wonder a majority of the images below are from these 3 places. Waiting 4 years for that shot! 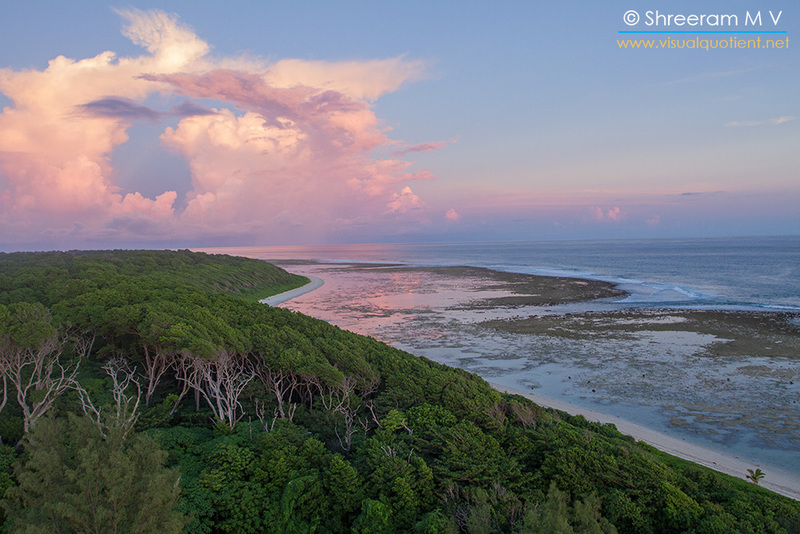 It was in 2012 that we first came across this light house in a remote corner of Andaman. After a three and a half hour walk in the humid rainforests by the beach, all I wanted to do was to lounge on the beach and get some rest. My more adventurous friends went up to take in the view from the top of the lighthouse. When they came down after sundown, I realized my folly. Over my next few visits, there was maintenance work going on at the lighthouse. I’d almost given up. On my recent trip, I was in for a surprise when the lighthouse was finally open again. After the gruelling walk, I needed no prodding to climb the winding staircase. And to see the view for myself. I had tears in my eyes when a flock of over 30 Nicobar Pigeons circled us before flying out into the sea. While wildlife photography is often associated with majestic large mammals and colourful birds, it is often the smaller creatures that make the journey joyful. 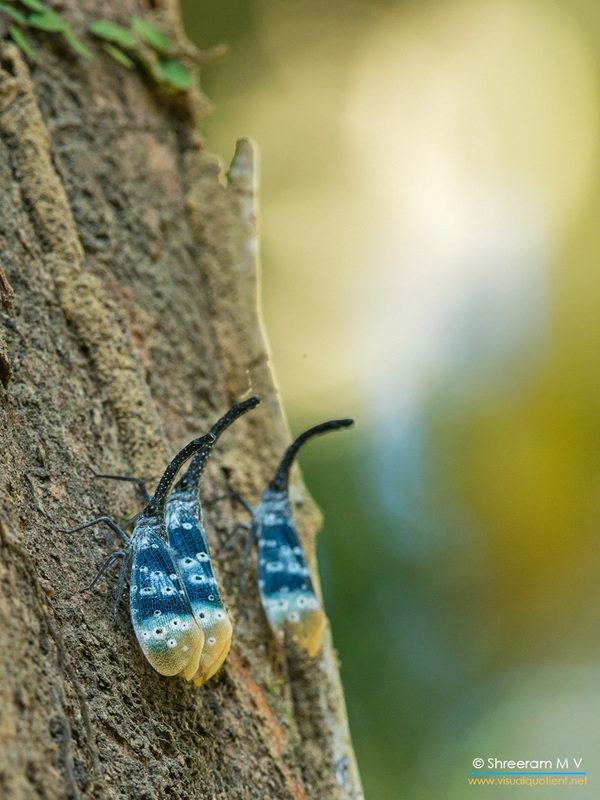 Like these beautiful Lantern Bugs (or Lantern Flies) that we came across on a walk in Little Andaman. Udit and I were returning to the KCRE campsite from Agumbe town. It was way past sunset and rainfall was imminent. That’s when our bike sputtered and stopped. A few kicks and it started. To stop once for all after a few metres. As we pushed our way down-slope, torch-light in hand, something shone on the path ahead of us. A Malabar Pit Viper in strike position. On the ground! We were excited as the snakes normally prefer an elevated perch (like a branch or a rock). As I was getting my camera out, a snail came along. There’s going to be some action, I thought. As it approached closer, it stopped to evaluate what lay in its path. The Pit Viper also seemed curious. And then, there was this face-off. 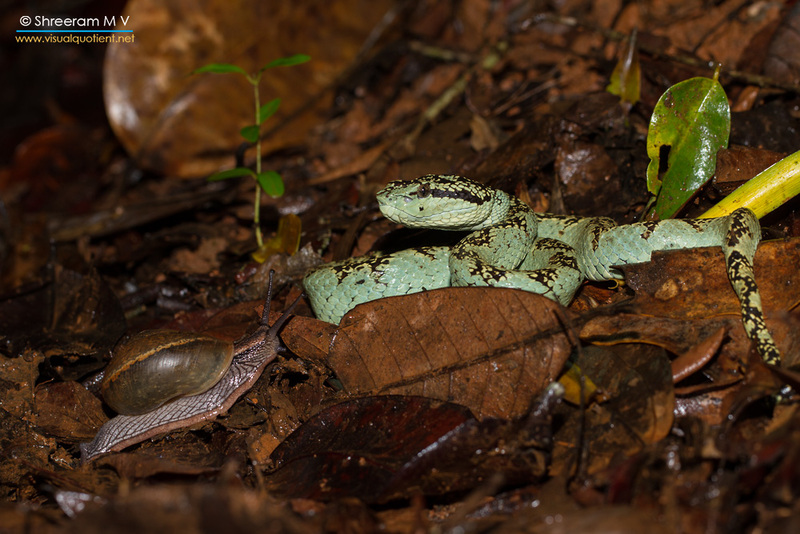 A Malabar Pit Viper and a Snail face-off in the rainforests of Agumbe. Yes, the snowy landscape really mesmerised me. Everywhere I looked, the mountains clad in their white attire looked stunning. Till I came across this village on the way down from Chang La. The lines and curves flitting through the snow..enough said. The patterns formed by the snow and the contours within the village were breathtaking! At Ladakh in winter. As we were looking out for birds on a forest trail in Nicobar, we saw a few monkeys disappear into the trees. A few moments later, we realized that they were still around, watching us (and probably calculating the risk that we posed). All through the 3 days that we were there, we came across many troops of the Crab-eating Macaque (or the Long-tailed Macaque). And every time, the behaviour was the same. The troop would seemingly retreat into the forest. Slowly, heads would start popping out of the undergrowth. After an eternity, one macaque would come out into the open. Eventually, the troop would decide to come out into the open if all seemed well. One vehicle passes by and back into the undergrowth! 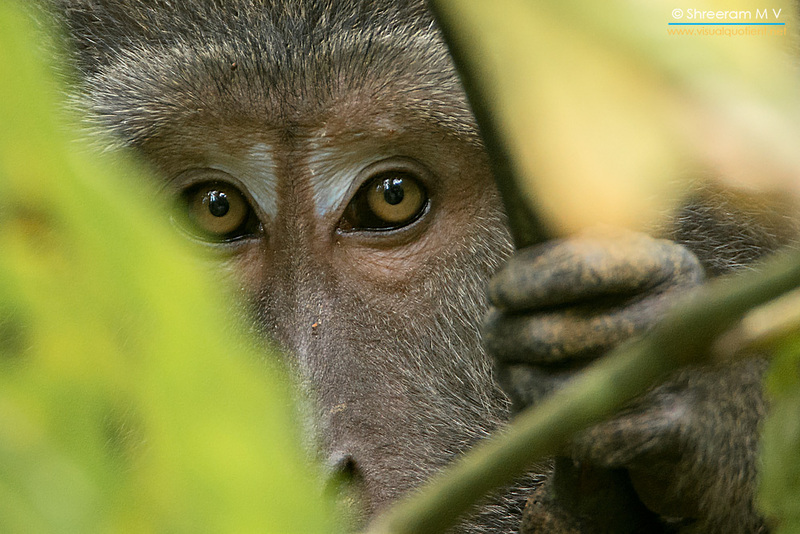 This photograph of a curious Crab-eating Macaque shows how they love watching from the undergrowth. The Vine Snake (Ahaetulla nasuta) started moving, swaying gracefully mimicking a vine in the wind, yet purposefully. We knew it had zeroed in on its prey, though we couldn’t see it. It was now close to the ground. In one swift movement, it grabbed the frog (Indirana sp.) and started climbing back up the tree. The frog was heavy and the snake struggled for a bit to find a nice place to settle down and finish off its hard-earned meal. The frog didn’t give up and put up a brave fight. Sadly for it, it was the snake that succeeded. 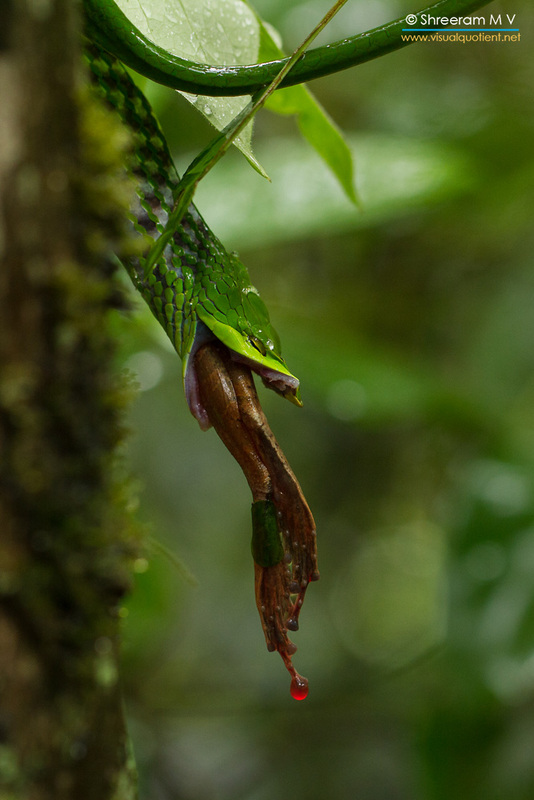 A drop a blood drips from the hapless frog as the Green Vine Snake finishes off its meal in the rainforests of Agumbe. If you thought spiders were the only ones that can weave webs, think again. Here’s a Weaver Ant Queen making a web. What’s that in her forelegs? Well, its one of her larvae. Weaver ant larvae can generate silk (unlike the adults). The mother is making a safe net for her young ones (the brood can be seen in the background) using her larva like a glue stick. How cool is that! 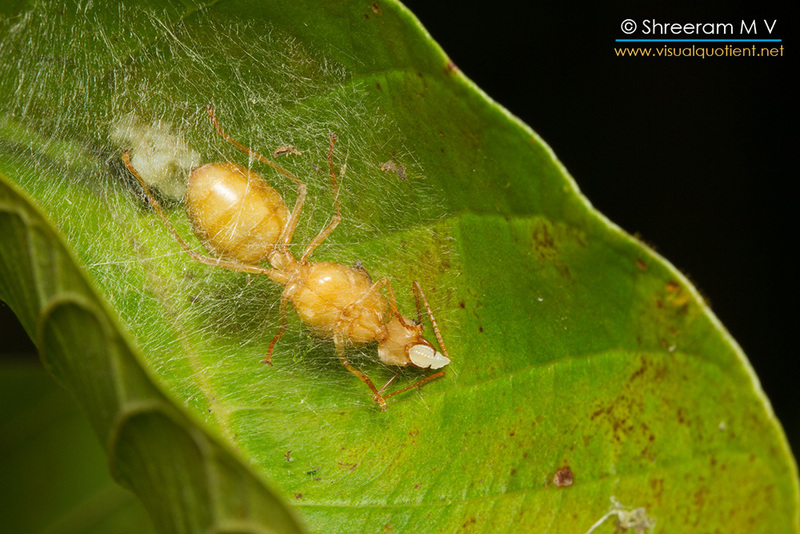 A Weaver Ant Queen uses one of her larvae to make a fine web to protect her brood. Those beefed-up muscles do say something! 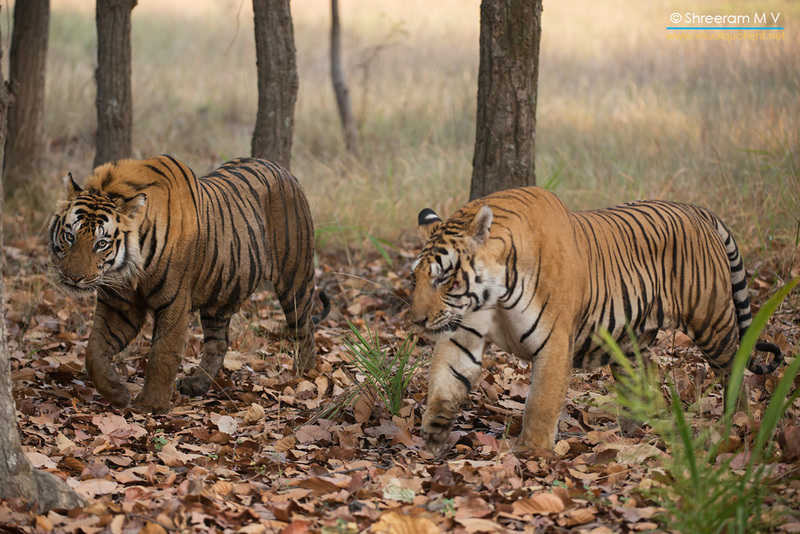 On my very first safari in Bandhavgarh, I came across these 2 huge male tigers sizing each other up for a fight. 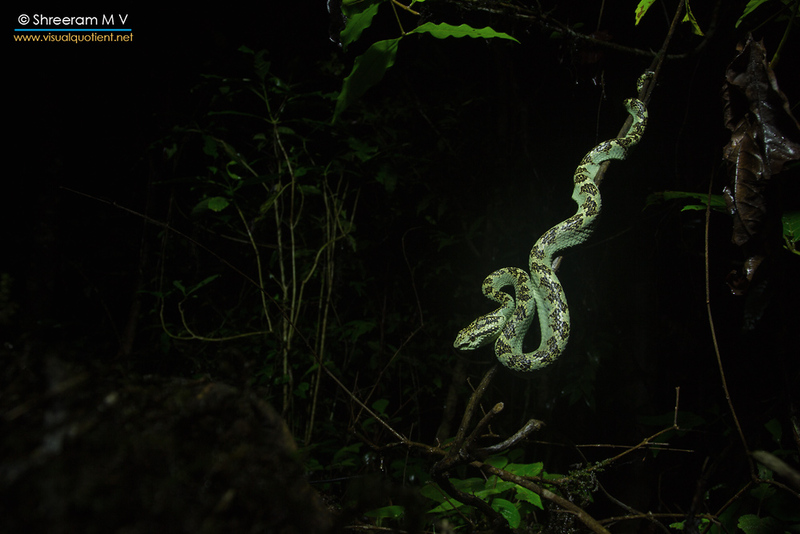 How does one show a Malabar Pit Viper in her nocturnal habitat? Here’s my interpretation. I started 2015 with an adventure – Darter‘s Winter Ladakh tour. 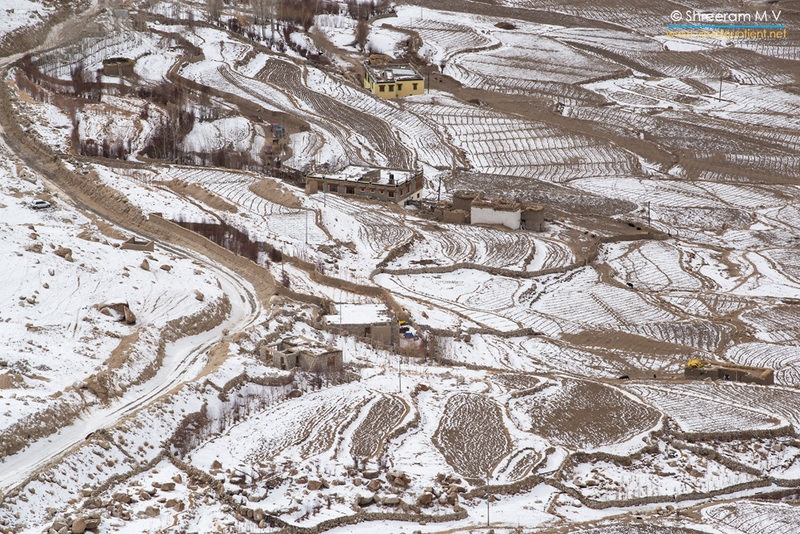 While Ladakh was familiar territory to me, the sub-zero temperatures weren’t. As I struggled to get my bearings in these extremes, I was surprised to see how life thrives in these conditions. Here, I present 2 photographs that convey this. In the first one, the shepherd is all smiles as she holds one of her sheep close to her. 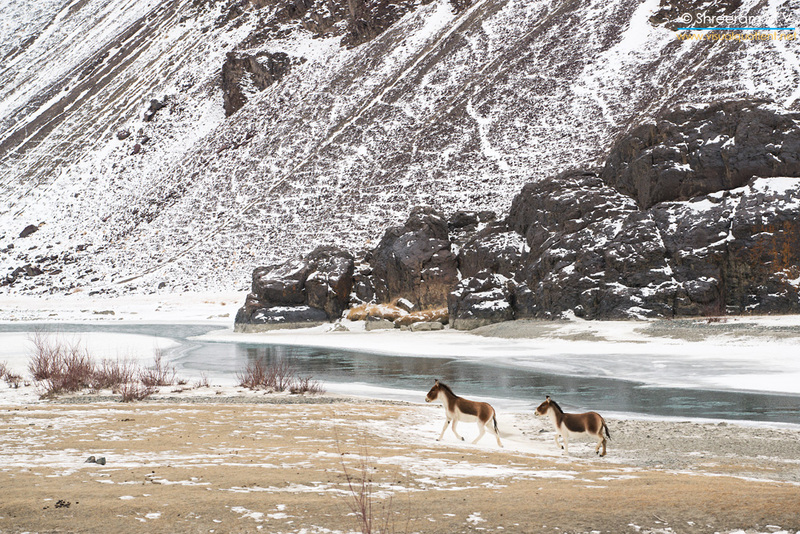 The second photograph shows 2 Kiangs (Tibetan Wild Asses) galloping across the snowy landscape. 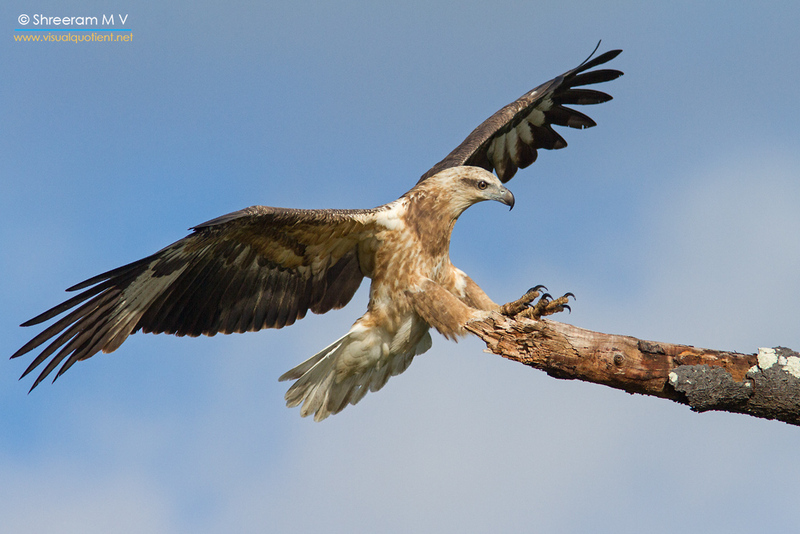 This juvenile White-bellied Sea Eagle graced us with its antics for over half an hour in Little Andaman. This was the pinnacle of the performance. Is there any doubt why this is one of my favourite photographs? Happy 2016 to everyone and may the best of life’s experiences come your way! « What’s that Squirrel-like animal? Excellent post and nice reading. Just like you put it “it is often the smaller creatures the make the journey joyful” , it is the smaller pelasures in life like enjoying the beautiful pictures on a saturday morning, that make life more joyful! Look forward to some interesting pictures in 2016! Fabulous posts and fabulouser pictures, Shree!!! Truly, your pictures bring joy to the viewer. Big fan of your work. Here’s to an even more colorful 2016 for you and Darter!